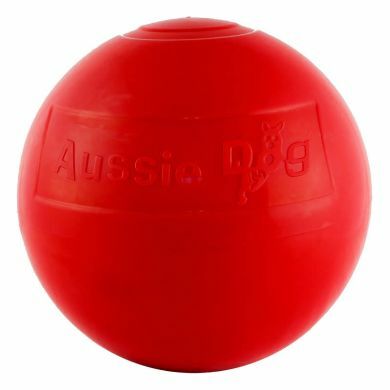 Aussie Dog's hard wearing Enduro Ball is made from thick and durable solid plastic so it will not pop, shatter or crack. Materials are 100% safe and non-toxic. An internal rattle provides added stimulation, and it is suitable for interactive or alone play. Large 24cm diameter - Suitable for heavy framed medium sized dogs to the largest dogs. A 12 Month Warranty Says Your Dog Won’t Chew Through It! IMPORANT NOTE: THIS BALL IS NOT DESIGNED FOR STAFFY OR STAFFY X BREEDS! Warranty will not apply if used with those breeds. If you have a Staffy or Staffy X, get the Staffy Ball. 100% safe both in shape, design & materials. Internal rattle or audio stimulation. 12 month warranty (excluding Staffy or Staffy X Breeds). A great hit with our X Cattle dog Clancy. He absolutely loves this ball and would play with it night and day if we didn't hide it to stop him. In fact his dribbling and passing skills have improved so much I think he is ready for the Socceroos team. Definitely his all time favourite ball. It is strong and robust (hard plastic) and good for outdoors and in (although a bit noisy on wooden floors) so it should last a long time It has a one year guarantee. I thought it a bit expensive when I ordered but now think it worth it as does our dog Clancy Beckham! Read 1 customer review of Aussie Dog Enduro Ball. The average customer rating is 5. Will send sep video of him dribbling with the ball shortly. He is hilarious!